What Is “SmartScreen” and Why Is It Running on My PC? Windows 10 includes SmartScreen, a feature that helps protect your PC from downloaded malware and malicious websites. The “SmartScreen” process—with the filename “smartscreen.exe”—that you see in Task Manager is responsible for this feature. SmartScreen was added for Windows 8, and it’s been improved in Windows 10. Whenever you download an application or file, the SmartScreen filter checks it against a Microsoft database. If the file has been seen before and is known to be safe—for example, if you download the installer for Chrome or iTunes—SmartScreen will allow it to run. If it’s been seen before and is known to be dangerous malware, SmartScreen blocks it. If it hasn’t been seen before and Windows isn’t sure whether it’s safe, Windows prevents the app from starting and warns you it may be dangerous, but lets you bypass this warning. This service is also used in Microsoft Edge and Store apps to block malicious web content. However, the operating system SmartScreen process helps protect you no matter what application you use to download files. It helps even if you use Google Chrome or Mozilla Firefox as your browser, or download the files with another application. RELATED: What Is “Antimalware Service Executable” and Why Is It Running on My PC? SmartScreen is just another layer of security in addition to Windows Defender, which is represented by the Antimalware Service Executable process on your PC. Having a security system with multiple layers helps keep your PC safer, even if you use another antivirus program and a web browser with its own anti-malware features. Why Is It Using CPU and Memory? Most of the time, the SmartScreen process sits in the background and uses almost no system resources. You may see it hovering at 0% CPU and just a few megabytes of memory used in the Task Manager. Windows may automatically close the process at times when it isn’t being used, so you may not even always see it running in the background. However, if you have SmartScreen enabled and you download a new application or file, SmartScreen kicks into gear. Windows launches it if it isn’t already running and you’ll see it use a bit of CPU and memory resources as it computes a hash of the file, sends that to Microsoft’s servers, and waits for a response to see if the file is safe. If it is deemed safe, Windows launches the application or file normally. The SmartScreen filter is used in addition to the usual antivirus checks, which are performed by the Antimalware Service Executable process if you’re using the default Windows Defender as your antivirus program. The amount of CPU and memory used should be fairly small and the entire process should be very quick, although larger files will take longer to examine than smaller files. This check is only performed the first time you open a downloaded program or file, so it doesn’t just waste resources every time you open an application. You can’t fully disable the SmartScreen process. Even if you turn off the SmartScreen feature in Windows, the SmartScreen process still launches when you sign into your PC. However, it uses no CPU resources and only a few megabytes of memory. You can forcibly end this process from the Task Manager, but Windows just launches it again automatically when it’s needed. You can prevent the SmartScreen process from using CPU and memory resources in the background by disabling the SmartScreen feature. We do not recommend this, though! SmartScreen is a useful security feature that can help protect your PC from malware. Even if you have other security software installed, SmartScreen can protect you from something your main security program might miss. It only uses a tiny amount of system resources, anyway. 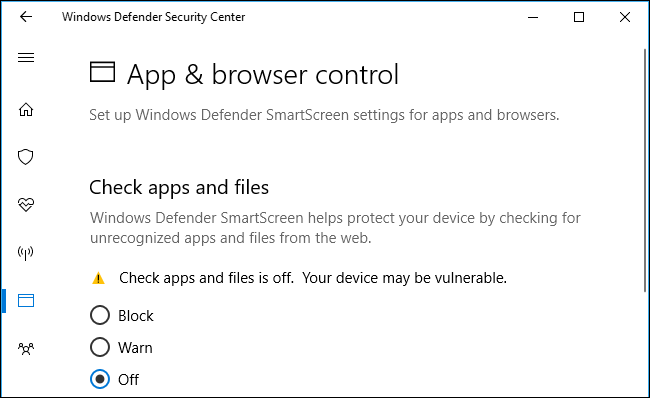 If you do want to disable the SmartScreen filter, head to Windows Defender Security Center > App & Browser Control, and then set “Check apps and files” to “Off” in Windows 10. We haven’t seen any reports of malware imitating the SmartScreen or smartscreen.exe process. This process is a part of Windows 10 and helps protect your PC from malware, although no security solution is perfect. However, If you’re concerned you may have malware running on your system, it’s always a good idea to run a scan with your preferred antivirus program just to check that everything is okay.